Throughout the world, people are on the move. These diaspora people do life in two places: the country they presently reside and their homeland. Unfortunately, Christians often do life without ever knowing who these dispersed people. This book goes in detail discussing five disciplines Christians should develop in order to effectively reach the nations and more specifically diaspora people near their locale. The goal of the above six lessons is to help cross-cultural workers learn one of many steps in unearthing the worldview of their focus people. As you work through this manual, be sure to do the assignments. Work though one lesson at a time, completing the activities and assignments before continuing onto the next lesson. Each lesson asks the reader to participate in certain exercises to apply the basic concepts from the lesson to their particular cultural context and host people. As learners engage the lesson exercises, they will learn to see, think, speak and write like an ethnographer. Plus, they will produce a brief ethnography on their focus people. Learners complete the lessons with a reservoir of material and knowledge on their host people. Moreover, they complete a twenty page ethnography on their host people. 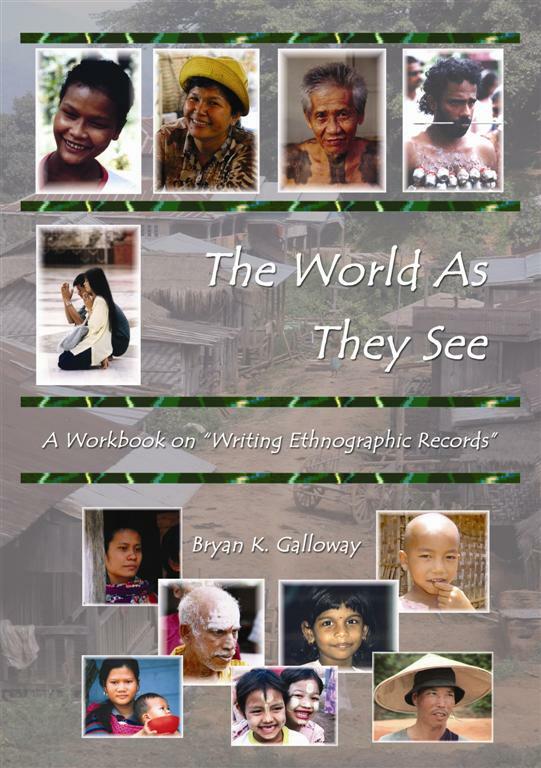 Included in the Appendix are several examples of brief ethnographies – one written from a thick descriptive perspective and another one written from a modified biographical life history perspective. Visit Bryan K. Galloway’s Amazon author page for a complete list of Books … click here.